Last week I spoke at the inaugural Mark Logic User Group meeting in Reston, VA (near where a lot of our government customers are based). The topic was MarkMail: where the idea came from, how we built it on the cheap, how Mark Logic began using it internally, and some lessons we learned as we scaled out the public high-traffic site. It's a similar talk to the one I gave at the Mark Logic User Conference in San Francisco last month. For those interested, the slides are available as a downloadable MOV file. Click to advance. The slides are fairly simple. Most of the fun of the talk (well, at least for me) is in the stories I tell, usually relating to the quotes in italics at the bottom of slides. I suppose you'll just have to use your imagination. I am so glad to know the first MarkLogic user group is formed. 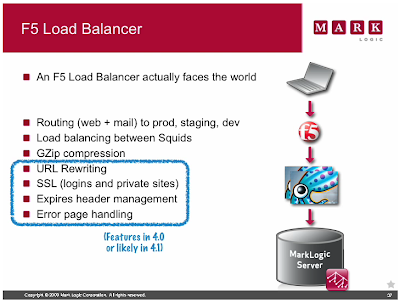 In the past year, I have been helping people and organizations to overcome the technical issues with MarkLogic. It is exciting to see such progress. Recently, my book--Beginning Mark Logic with XQuery and MarkLogic Server is published to help users learning XQuery and MarkLogic.